The great poet, Sufi Shaykh Imam Sharfuddin Abi Abdullah Mohammed bin Sa’eed al-Misree Rahmatullahi ‘Alaih was born in 608 A.H or 1212 C.E. in Misr (Egypt). He was well known by his surname Busiri from Bushire, to which one of his parents belonged. The other is being from Dalas in Egypt. He also got a compound surname of Dalasaree. He studied in Cairo, where he specialised in hadith and Arabic literature, two disciplines that helped to make him the foremost exponent of Muslim religious poetry. He was a disciple of Imam Abu’l ‘Abbas al-Mursi Rahmatullahi ‘Alaih who was a Khalifa of Imam Abu’l Hasan ash-Shazili Rahmatullahi ‘Alaih. Much of his professional life was spent in the three holy cities, where he became a famous teacher of the Qur’an. After his return to Egypt, where he managed a Qur’anic school, he passed on to his Lord. The exact year of his death is not known, but 695 A.H. or 1296 C.E. is the most commonly given date. He cultivated the art of penmanship with great pains, and followed it as his profession, earning great distinction as an excellent calligraphist. He also took a good deal of interest in the study of oriental languages and usages. His fame, however, depends not so much on his proficiency in calligraphy as on the several eulogistic poems, which he wrote about the Prophet Mohammad, (Peace of God be on him) of which three are well known. Almost all of Busiri’s written work takes the form of poetry, including a long and extraordinary poetic commentary on Christianity and Judaism, based on his study of the Bible. He also wrote a Diwan, an anthology of poems on a wide range of subjects. The poem known as Hamziah, a very long, sonorous and beautiful poetic production, which redounds much to the credit of its writer. His best-known work, however, is the Burdah (Poem of the Mantle), which rapidly became the most popular religious poem in the Islamic world, a position which it retains to this day. Poets raised in the Islamic world beginning with Hassan ibn Thabit and Ka’b ibn Zuhair put forth the most mature works of their genius and art in eulogies and odes written for Prophet Muhammad (pbuh). However, some of these are considered more fortunate than others due not so much to the artistic value of their work, but to the fame they gained. One of those heading this caravan is Imam Sharfuddin Abi Abdullah Mohammed bin Sa’eed al- Misree who lived in Egypt in the 13th century. Born on Shawwal 1, 608/ March, 1212, in Behsim tied to the city of Behnesa in Upper Egypt, Muhammad al-Busiri was a Berber from a family known as ibn Habnun from the Hammad Fortress in Morocco. He is called Busiri from his father’s side and Delasi from his mother’s side. It is seen that the poet sometimes combined the two words and used Delasiri. His childhood passed in Delas where his family settled. Later, going to Cairo, he studied language and literature in addition to Islamic sciences. It is understood that he was more preoccupied with hadith (sayings of the Prophet) and sirah (the life story of the Prophet) and that, in view of the rebuttals he made against Judaism and Christianity; he had broad knowledge of the Old and New Testaments. After working some time as a scribe in the treasury in the city of Bilbis, he returned to Cairo and participated in educational and teaching activities in the Quranic private teaching institution. Later on, while working as a scribe in the cities of al-Mahalla and Seha, he became very uncomfortable with the corruption made by his fellow-workers who were Christian civil servants, and he expressed this in his poetry. Short and weak, Busiri’s main complaints were his wife’s ill temper, his large number of children and difficulty making a living. Affiliating with Abul-Hasan es-Shazeli, the founder of the Shazeli dervish order, the poet mentions the sheikh’s virtues and merits with praise in an elegy of 142 couplets ending with “branch” addressed to Abul-Abbas al-Mursi, who replaced Sheikh Shazeli after his death. It can be understood that the famous sufi Ibn Ataullah of Alexandria and Busiri were Sheikh Shazeli’s two most prominent disciples. However, while Ibn Ataullah used the theme of divine love, Busiri celebrated more love for the Prophet. Busiri became paralyzed towards the end of his life, but it is related that he recovered by means of a eulogy he wrote for Prophet Muhammad and died in his eighties (696/1296-97) at Alexandria after a long life. 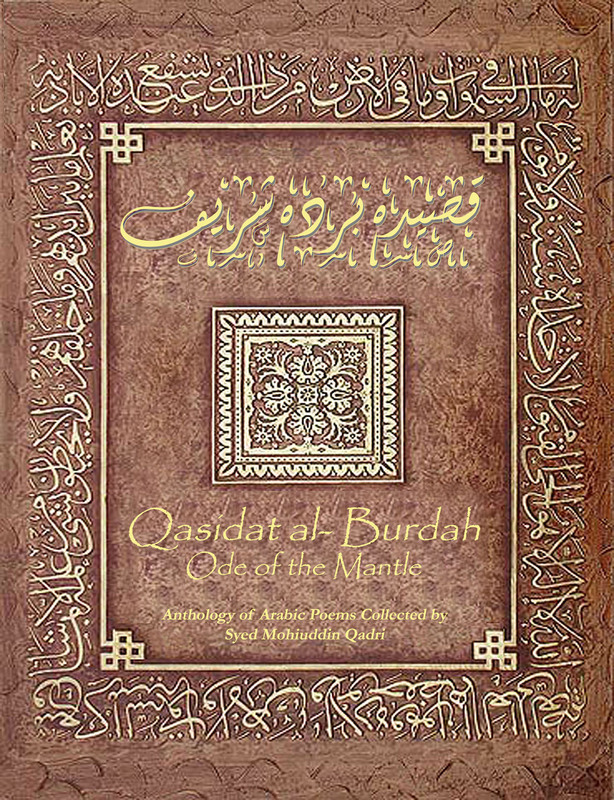 Almost all the works of Busiri were written in verse and are odes written about the Prophet. They are extremely sound and lyrical in regard to poetical structure and style. For this reason, his odes and eulogies have been shown great interest over the centuries in every region of Islamic geography and are among poems read most at religious gatherings. Consisting of twelve eulogies which were dispersed in classical sources, his poetry was gathered together and published under the name of Diwan al-Busiri (pub.Muhammad Sayyid Kaylani, Cairo, 1374/1955). His most famous work world-wide in the field of Islamic literature is the160 or 165 verse poem known as the Poem of the Mantle (Qasida al-Burdah). An enthusiastic lover of the Prophet, Busiri called the ode that made him famous “al- Kawâkib al-durrîya fî madh khayr al-barîya”. It being called the “Ode of the Mantle” stems from the dream he saw.